Why do we assume plant-based foods are healthy? I used to thi nk it was because fruits and vegetables were a good source of fiber and antioxidants. I thought these powerful plant ingredients fought off cancer and disease and promoted health and longevity. But after finding no validity to these claims, I surely thought it was because of their vitamins and minerals. Vitamins and minerals are micronutrients. Whereas macronutrients (protein, fat, and carbohydrates) provide energy, micronutrients help release energy from these macronutrients while also performing myriad of functions like healing wounds, bolstering the immune system, and repairing cellular damage. Vitamins are organic compounds found in plants and animals. Because they are compounds they can be broken down by things like heat and acid. They are more “fragile” than minerals. And therefore, cooking, storage, and even air exposure can inactivate them. Four of these vitamins are fat soluble* and the other nine (C and B vitamins) are water soluble. This is important because fat soluble vitamins get stored in body tissues, mainly fatty tissues and the liver. Taking in too much for too long can lead to hypervitaminosis (too much vitamin). Deficiencies in fat soluble vitamins can also occur especially with inadequate fat intake or a diet poor in these vitamins. In contrast, the water soluble vitamins, B and C, do not store up in the body. If you consume more than you need, the excess is excreted. However, unlike the fat soluble vitamins that store up, vitamins B and C must be continuously replenished in the diet. 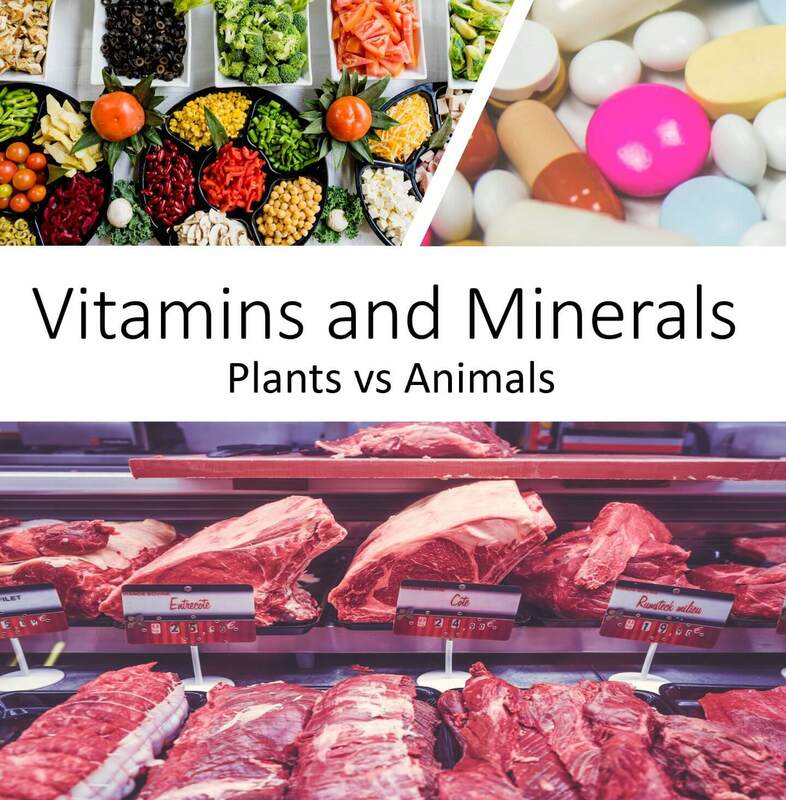 Minerals are inorganic elements also found in both plant and animal foods. As elements, they hold their chemical structure and aren’t broken down like vitamins. These minerals play important roles in basically every function of the body. They help regulate blood pressure and fluid balances. They keep muscle and nerve cells firing. They deliver oxygen and facilitate cell growth and replication. As with vitamins, mineral deficiencies and toxicities can occur if intake is inadequate or in excess. Plant-based food does not provide complete nutrition. It is missing essential nutrients that humans must get through animal foods. Meat provides complete nutrition. It contains all the macro and micronutrients humans need to function. Throughout human history, animal-based foods were the only ones that would have been available year round. If meat didn’t provide complete nutrition, humans wouldn’t exist. There are 3 vitamins that do not exist in plant foods. Let’s look at a comparison between plant and meat vitamins and minerals. Vitamin A – It is approximately 20 times more bioavailable in animal-based food than plant foods. In fact, plant foods don’t actually have any vitamin A. They have carotenoids which have to be converted to Vitamin A.
Vitamin B – Animal-based foods are the best source of B Vitamins. Vitamin B12 is exclusively found in animal-based foods. Vitamin D – Plants don’t contain Vitamin D3 (the form our body needs). Sun and meat is our answer here. Vitamin E – Plant-based foods have higher concentrations of vitamin E. And for good reason. A plant-based diet requires additional protection from oxidation of PUFA which Vitamin E helps provide through its antioxidant properties. It’s still found in adequate supply in meat. Vitamin K – Both plant and animal foods have the K1 version; however, plants don’t have K2 which is vital for human life. K2 also has numerous forms. The essential kind we need is MK-4, which is only in animal food. We can convert some K1 to MK-4 but generally not enough to meet our needs. 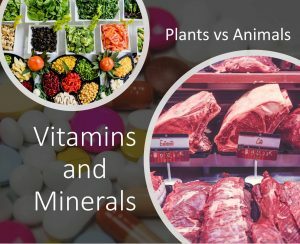 While all essential minerals can be found in both plant and animal foods, there is a stark difference in absorption of these micronutrients. 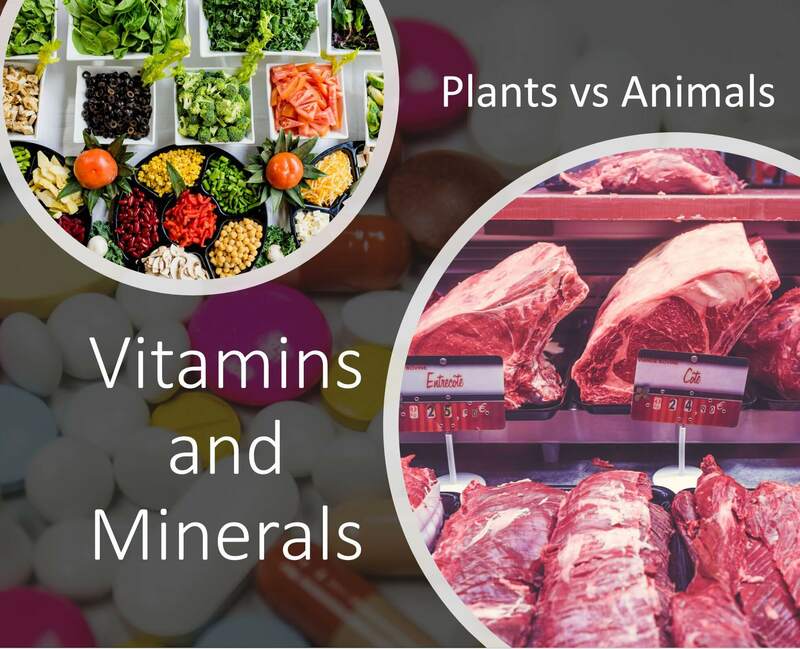 Animal-based nutrients have higher bioavailability as well as less hindrance from “antinutrients” that come pre-packaged with plant-based food. Iron is a prime example of the difference in bioavailability between plant-based and animal-based minerals. Iron deficiency is the most common nutrient deficiency in the world. And since iron plays a vital role in carrying oxygen to cells throughout the body deficiencies lead to fatigue, weakness, pallor, and anemia. Memory and cognitive problems are common symptoms when iron levels get too low. There are two kinds of iron. Plant iron = non-heme iron. Animal iron = heme iron. Plant iron, the non-heme version, is at least 3X less bioavailable than heme iron from animal sources. To make matters worse, plant-based foods contain antinutrients that further inhibit the absorption of numerous minerals, including iron. Phytates, for example, interfere with the absorption of plant iron, thereby making a poor source of iron even worse. Studies have shown that vegetarians often have similar iron intakes to omnivores on paper, yet they suffer a higher degree of iron deficiencies. For example, a study of 75 vegan women found that 40% of them were iron deficient, despite having iron intakes that were above the recommended daily allowance (RDA). But in essence, plants contain phytochemicals used to deter predators from eating them. Many of these phytochemical interfere with absorption of essential vitamins and minerals. Iron, calcium magnesium, and zinc are all hindered by various antinutrients. So when a plant-based food says it has 50% of your RDA of zinc, it may be off, way off. For example, many plant-based foods are lower in iodine and zinc compared to animal foods. It’s important to evaluate other nutritional differences between plants and animal foods beyond their micronutrients. Most plant-based foods are incomplete proteins. This means various plant-based foods have to be combined to get all the amino acids needed. Exacerbating the situation, these proteins are mostly found in plant seeds which often contain the highest concentrations of antinutrients and phytochemicals that can impair human health. Animal-sourced protein is complete protein. The amount of vitamins and minerals one needs is inextricably linked to countless factors such as one’s overall diet, lifestyle, gender, age, ect. Blanket statements and recommendations like RDAs are massive generalizations that can range from a little off to way off. For example, the switch from a heavy meat-based diet to a heavy plant-based diet results in a higher degree of folate deficiencies. (r) This is contrary to what the “label” may have you predict. Context matters. We live in a society that often thinks “more is better.” But when it comes to nutrients, the right amount is what we want. A diet “high” in Vitamin C isn’t necessarily better or good. A diet “low” in Vitamin E very well may be optimal in the context of that overall diet. Plants do contain another macronutrient that animal foods don’t – fiber. Some people think this is why plant-based foods are necessary. However, contrary to popular belief, humans don’t need fiber, and it’s often detrimental in the diet. For example, many plant-based foods come packaged with insoluble fiber which can bind to magnesium. Thus, fiber acts like an antinutrient preventing nutrient absorption. If one wants to eat plant-based foods for their vitamins and minerals, that’s all fine and well. However, it should be recognized that plant-based food is incomplete nutrition requiring the mixing of various plant-based foods together, supplementing, or including animal foods in the diet. Meat is complete nutrition. It doesn’t require the addition of plant-based foods or supplements to obtain all macro and micronutrients we need. And I think it’s fair to say that meat is a superior choice to plant-based food for your vitamins and minerals. Which meat provides vitamin A, K and C? Most meat provides all (in varying quantities). For example, beef liver is extremely high in Vitamin A whereas beef tenderloin has much less. Same goes for vitamin K – pork chops, bacon, ground beef chicken…And contrary to “conventional wisdom” fresh meat is a source of vitamin C (more on that here: https://www.kevinstock.io/health/do-humans-need-vitamin-c/). What about sugar? Doesn’t the body require sone sugar? The human body has about 1 tsp of glucose (sugar) in all the blood. Only a few cells in the body require any glucose at all, all of which can be made from protein. There is no essential carbohydrate. No need to eat any sugar at all. Dr Stock I am thankful for all of this info but would there be a medical reverence I can refer my husband to (he is concerned I am eliminating vegetables). Anything published on pubmed yet?? I am so ready to jump in with both feet, but I need to understand about electrolytes. I chronically run low in magnesium and potassium, so I’ve been supplementing magnesium and eating a full avocado and 6 cup of mixed greens per day, plus using lite salt. Tips how to transition off these, or should I supplement both? The fact that you are running low could be from the antinutrients in your current diet. But as you transition many people have an easier time supplementing these – and in your case I’d think that is likely the case. Then after a month or so, you can gradually wean off them and see how you do. I’m doing only beef and water now, and feeling much better, but I have a question: I have had a thyroidectomy (papillary cancer), and during surgery my para-thyroid was damaged. I’m currently supplementing with 2000 mg calcium per day (just tested, and my calcium level is at a minimum accepted level). Any suggestions here (I cannot take dairy, it upsets my stomach and makes me feel sick). I’m guessing there’s a maximum amount that the body can absorb? 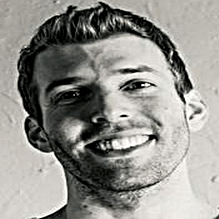 Is there a chance my para-thyroid can heal itself from this diet? Unfortunately all I can add is to work with your doctor on this one. Glad to hear you are feeling better! Are you also getting Vitamin D3 and Vitamin K2? For the former, I like a UVB lamp. For the latter, Google can provide dietary sources. Ideally, the natural and/or whole forms of vitamins and minerals are preferred, as isolated supplements are not the same as food. At best, they’re incomplete analogues. At worst, they may be harmful. This coming from someone who used “good,” expensive supplements for years. Of course, each person and situation is different. Good luck. True of eating “truly” “nose to tail” and also in context of the individual (individual biochemistry). For example of your in ketosis (or fat adapted and using ketones as your primary fuel source) then not as much vitamin c is required to convert glucose directly from carbs into energy. The amount of c through consumption of quality beef liver will suffice. Folate is another vitamin that is difficult to attain from meat only unless your actually eating the entire animal. Drinking bone broth and eating beef liver isn’t nose to tail. Based upon your individual genomics/epigenetics and lifestyle you may need to eat some veggies or supplement. We need potassium, magnesium and sodium. How can I get that in the carnivore diet? Thank you for your precise answers!! I do recommend salting to taste as well. I do believe on a carnivore diet we need to eat liver. Is Vitamin A toxicity a concern? How much liver should we eat daily or weekly? What amount is too much? I don’t think you “need” to eat liver (many people don’t any have thrived for decades without eating organs). Personally, I like it and eat it every week or two. Liver is a great source of nutrition. But like you said, theoretically vitamin A toxicity could be a concern (as liver has a lot) and if eating large amounts of liver regularly perhaps it’s possible – how much is really going to depend on the person – though I’ve corresponded with thousands of people eating a carnivore diet and have not heard of one person who has had vitamin A toxicity (not saying it’s not possible, just I think this fear is overblown by some people).